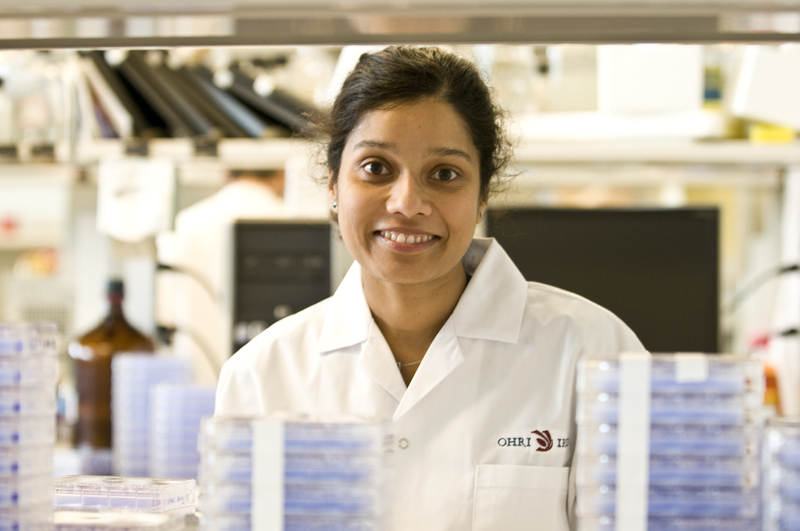 In her work at the Ottawa Hospital Research Institute, Dr. Rozanne Arulanandam explores how oncolytic viruses (viruses that treat cancers) work. These viruses, Rozanne explains, offer a natural way to target tumours and are often safer than traditional therapies like chemotherapy or radiation. Her research on how oncolytic viruses can target tumour blood vessels has been recently published in the journal Cancer Cell. The 2009 H1N1 outbreak and subsequent vaccine shortage gave the Ottawa-based company ChemVirion R&D the idea to use these viral sensitizer compounds to enhance vaccine production, explains their president Dr. Jean-Simon Diallo. But as a small company, it needed additional resources to move this research forward. So ChemVirion partnered with Rozanne and her supervisor, Dr. John Bell, at the University of Ottawa to undertake a Mitacs Elevate fellowship (then called a Mitacs Industrial Fellowship), which focused on commercial-level vaccine production using the viral sensitizers. The [Mitacs] Step workshops, especially the Project Management ones, helped me bridge the differences between working in academia and working with an industrial partner,” Rozanne says. Although the Mitacs project has since concluded, both Rozanne and Dr. Diallo say the impact of its work is still being felt. “It was a great opportunity to develop with this project and the collaboration is still evolving,” Rozanne advises. Mitacs thanks the Government of Canada and the Government of Ontario for their support of the Elevate research internship in this story. Across Canada, the Elevate program also receives support from Alberta Innovates, the Government of British Columbia, the Government of New Brunswick, the Government of Newfoundland and Labrador, the Government of Nova Scotia, the Government of Prince Edward Island, the Government of Quebec, the Government of Saskatchewan and Research Manitoba.